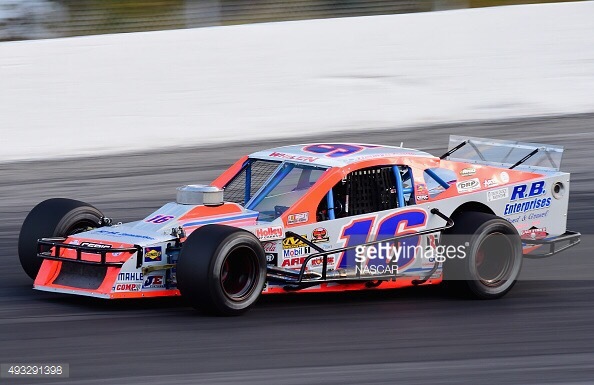 Timmy “The Natural” Solomito gets his first Whelen Modified victory at the Ice Breaker 150. I was not able to be at Thompson for the race,but I was able to watch the entire event on Fans choice tv. They did a great job of covering the entire event. So I thought I would cover this race from my couch. Solomito started 13th after some tire issues in qualifying. #2 Doug Coby started on the pole with #6 Ryan Preece next to him on the front row. Donny lia, Ron Silk, and Jason Bonsignore filed in behind the front row for the start of the Ice Breaker 150. 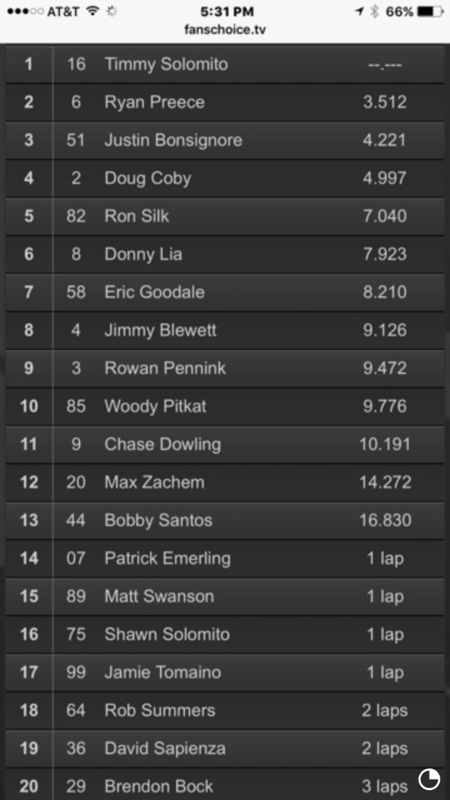 Preece took off like wild fire leading for the first 50 laps with Coby a not to distant second. #51,Bonsignore was the car in the move, passing his cars on the bottom, making his way to the front. While the cameras where on the leaders #16 Solomito was quietly making his way to the front of the pack as well. There was good racing through out the top ten. Eric Goodale, Silk, and Bosignore kept the fans on their feet for a good part of the early stages. Preece was making fast work in lap traffic, putting all but 16 cars a lap down by lap 50. #3 Pennick and Blewitt battled back and fourth for a few laps until Blewitt made the pass on the #3 car for the 8th spot. On lap 81 Blewitt and a few other cars made contact bringing out the first caution if the day on lap 81. Pit road was closed for a few laps and then on lap 84 the most of the field made their way down the very tight pit road for their one and only stop. The leaders changes rear tires and the right front tire during their stops. Solomito made a small chassis adjustment, and with fast work from his crew he would restart in the 4th position. Bosignore lead Preece, Coby, and Solomito to the green on lap 92. Solomito and Preece raced side by side until Solomito finally made the move in the bottom to move into the two spot behind Bonsignore. #16 set his sites in the leader. Making fast time if it Timmy took the lead from Bonsignore, and pulled away to a 3 car lead. Meanwhile Preece started to work on The #51 car for second. Blewitt got tagged by #3 car if Rowan Pennick bringing out the day’s second caution. Blewitt stayed on the lead lap back in 12th. Restart on lap 103, Solomito picked the outside line putting Bosignore to the bottom ahead of Preece. Coby lined up behind The leader in the out side. Green flag, Solomito lead the field into turn one with pla little push from Coby. Preece took this opportunity to get close to the rear of the #51 car of Bonsignore. Preece made his move past Bosignore for second in lap 108. The Natural was still out front in his #16 trying to pull away from the field. Preece was not having any of that. Ryan made is move in the leader down the back stretch, then keeping his car pinned to the bottom, making the pass coming out if turn four. Preece was back out front with Solomito a close second. With 30 laps to go Solomito pulled alongside of the leader Preece one last time. Timmy got by Ryan for the lead and pulled out a three car lead in just a few laps. Bonsignore, and Coby battled for the last 20 or so laps making for a good finish behind the top two spots. Solomito worked his way through traffic with ten laps to go. 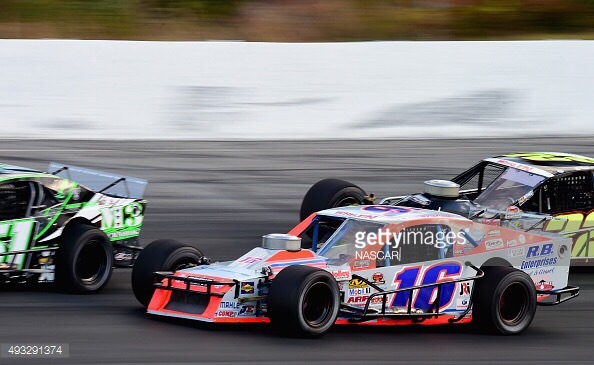 Timmy was looking for his first win On the Whelen Modified Tour. With one lap to go Timmy had almost a 3.5 second lead on the second place car of Preece. Solomito rounded turn four for his biggest win of his career the Ice Breaker at Thompson. The #16 crew cut it close with fuel, they had to push Solomito into victory lane. Now that’s close. The image below shows the top 20 at the finish. I have never been to Thompson speedway for a race, but after watching this race I will put it on my list for tracks to go to in the near future. I will see you at the races.